Speaking common sense to the senseless, the dim, and the hypoxic in San Jose. First amendment, free speech, news suppression, and censorship. I have learned from reports on the internet that Nevada has a Federal Bureau of Land Management First Amendment Area. 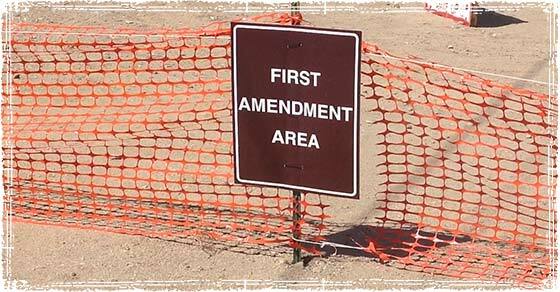 Official Federal Bureau of Land Management First Amendment Area. To my knowledge, San Jose has no such facility. Isn’t it time that local politicians move into the twenty-first century and demand that the BLM establish a First Amendment Area in San Jose at least as big and as grand as Nevada’s. The First Amendment isn’t just a privilege for rubes and bumpkins in rural Nevada. And while we’re at it, we could gain some much needed gravitas for our community by establishing a local Second Amendment Area, a Fifth Amendment area, and even a Tenth Amendment Area. This entry was posted in Free Speech on May 6, 2014 by sjoutsidethebubble. This entry was posted in Free Speech, Political Tribalism on April 24, 2014 by sjoutsidethebubble. I don’t mind that the Mercury News is a liberal newspaper. Liberals are entitled to be lied to just as much as anyone else. But what I find remarkable is that the Merc is more than just a liberal newspaper, it is a political party newspaper. Certainly, the Merc’s pages are awash in blather that validates moonbat thinking from all the usual suspects of narcisso-utopian-collectivist universe. But where the Merc goes beyond is in it’s explicit, targeted bashing of REPUBLICANS and the REPUBLICAN Party. With Latinos less than a year away from becoming the majority group in California, things aren’t looking “arithmetically good” for the mostly white Republican Party, Jeffe said. And … Etc. Etc. Etc. There is an important legal difference between being a “liberal” newspaper” and being a “political party newspaper”. Businesses and people who pay for advertising in party newspapers are “political donors”. and therefore subject to campaign finance reporting and limits. But, more importantly, money donated to candidates and campaigns CANNOT be claimed as a business expense and therefore CANNOT be deducted from income taxes. So, if all the advertising dollars spent on ads in the Mercury News were suddenly NOT deductible, businesses might not advertise in the Merc. Undoubtedly, the Merc has many mouths to feed, but if the ad revenue were not coming in the door, many of those mouths would not get fed. In the era of one-party politics in California, the Mercury News is probably safe for the time being in its role as de facto Democrat Party newspaper. But the Democrat Party is really a collection of old dinosaurs (Harry Reid, Nancy Pelosi, Jerry Brown, Dianne Feinstein, Barbara Boxer, Mike Honda) on the doorstep of becoming octagenerians, and the Millenials and Generation X’ers are not committed to keeping dinosaurs or dinosaur newspapers around. Ever heard of Facebook? Twitter? This entry was posted in Free Speech, Political Tribalism on April 9, 2014 by sjoutsidethebubble. Environmentalists and the “Affordable Housing” bond measure.